In last week’s blog post, Content Marketing: The Lifeline of Your Online Business, we discussed why and how content marketing plays such a fundamental role in inbound marketing. Now, this week (as promised) we’re going to be talking about how you can create great content that will gain traffic and/or leads. Why Are We Creating Great Content? One of the biggest challenges that content marketers and small business owners who are committed to inbound marketing face is being heard. The internet has become a noisy place full of mediocre (and often downright crappy) content. There are nearly Facebook users share nearly 2.5 million pieces of content a minute, and 500 million Tweets a day. To stand out from the crowd, business owners and marketers have to create something that is genuinely remarkable. It has to be something that people find useful, relevant, entertaining and unique. Creating great content helps business owners and marketers to stand out from the crowd and be heard. It’s easy for us to tell you to create “great” content, but what does that even mean? What’s “great” to one person, is just “mediocre” to another. So let’s steer away from the subjective terms and get objective. Very generally, great content is content that your target audiences genuinely loves. I know. It sounds like a lot. But the reality is that you don’t have to – and most likely won’t – start out with “great content”. Very few people begin their content marketing journey with great content. It’s the good content that will get you on your way to great content. And then, once you’ve established yourself as useful (or entertaining… or both!) and you’ve gotten into the swing of things, you’ll start to develop your content and begin to focus on making it great. And even then, not every piece of content you create will have each and every box ticked. That’s a reality. But the idea is that we’re always striving towards this end goal. Remember, the true key to creating great content is perseverance. And a little bit of luck, too. If you can master these 8 keys to great content, you’ll be well on your way to mastering content marketing. With humans creating as much information in 2 days, as we did in the entire time before 2003, originality has become more important than ever for businesses who want to stand out from the crowd. It will make you a valuable source of information that your readers can’t find anywhere else. Search engines love it. Google has made it clear that they do not like and will penalize sites with duplicate content. Likewise, Google rewards original content. Your headline is the first, and often the only, impression you make on a prospective reader. Without a compelling headline to entice your audience into reading the rest of the content, your accompanying text is pointless – no matter how good it is. But it’s not as easy as creating catchy headlines and crappy content – That’s called click-bait and people hate it. Instead, there’s a very fine balance where we create informative headlines (that contain your keywords), but also ignites curiosity in your readers. The importance and complexity of creating the perfect headline can’t be captured in a subheading of a blog. It’s just too much, too important… so important that it needs its very own blog post. Oh, right. We did that! Head on over to “If You Only Read One Post About Headlines, Read This One” to get an in-depth look at how to create amazing headlines that get your posts read. 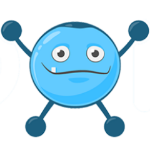 I know, I know – you want to write for humans, not for search engines. But here’s the thing: Keywords, when used intelligently, are for humans. Keywords allow for humans to find relevant content. Search engines simply mediate between your content and internet users to ensure that the end-user is presented with the best content possible. In the end, search engines are only a tool to facilitate humans. 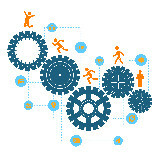 Keyword research allows for us to understand what terms our target audience are searching for. It allows for us to create more relevant and targeted content that we know our audiences want to read. Obviously, the more general your search term, the more often it’s searched for. But the problem with general popular search terms is that they actually only make up less than 30% of all search terms. The other 70% is called the “long tail” of search. The long tail keyword contains hundreds of millions of unique searches that might be conducted only a few times in any given day. Moreover, research has shown that the more specific and long-tail the keyword that someone uses, the more likely they are to actually buy. To better illustrate this, let’s look at the explanation by “Search Engine Optimization – An Hour a Day”. In this example, a snake is used to illustrate the difference of psychology with relation to keywords. Now think about what’s going through the mindset of each person who’s making each query. The keyword “snake” is general, and could just be someone curious about learning more about snakes. 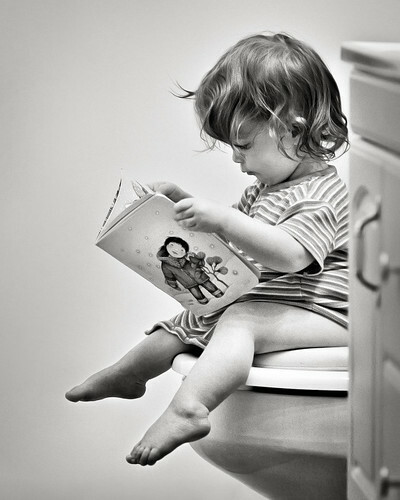 It could even be a kid doing some research! There’s going to be tons of information, and they won’t have to pay a dime for it. The same happens for the second keyword “poison snake”, this still could very well be research for a project. But things start to change the further down the analogy we get, and the more specific (and long-tail) with the keywords we use. “Poison snake bite” could be about research, sure – but it’s much more likely that the person is looking for a diagnosis, or for a treatment kit. Here we’ve moved from the general idea of a “snake” to something much more specific that indicates a more urgent need. 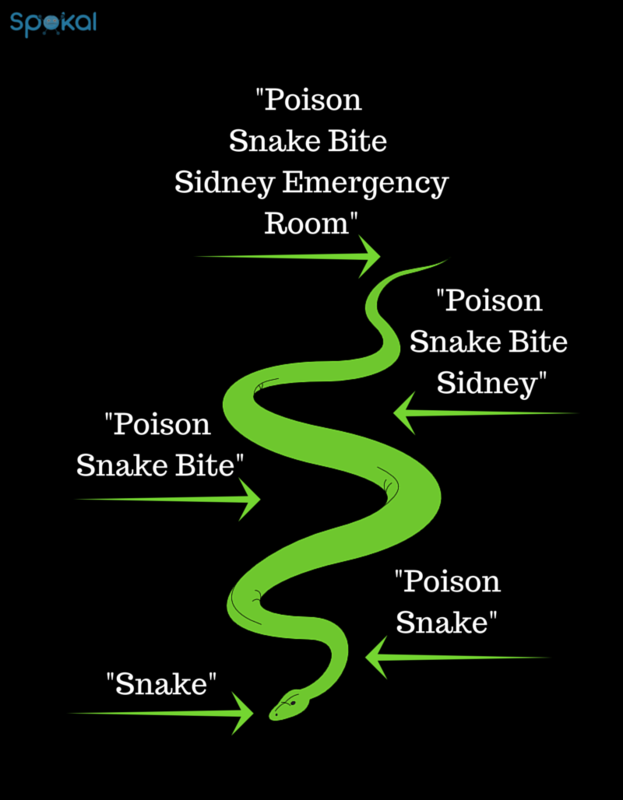 Finally, at the last keyword “poison snake bite Sidney emergency room,” we know that it’s very likely that someone needs help right now. They’re ready to act. The same can be applied to your keywords. The more specific and long-tail they are, the more likely you are to attract high-quality readers (who want to act) to your website. Moreover, there’s far less competition for these keywords, so you’re more likely to rank highly for them. For keyword research, Google’s Keyword Planner Tool is the most popular starting point. It not only suggests keywords and provides estimated search volume, but also predicts the cost of running paid campaigns for these terms. Remember: You’re looking for keywords that are commonly searched for, but whose competition is low – which means that people are looking for content on those keywords, but what’s available isn’t great. This is the optimal opportunity for you to create content that will rank highly in search engines. What do your users really want? What do they like? What do they find interesting? What do they hate? Not sure what’s relevant? 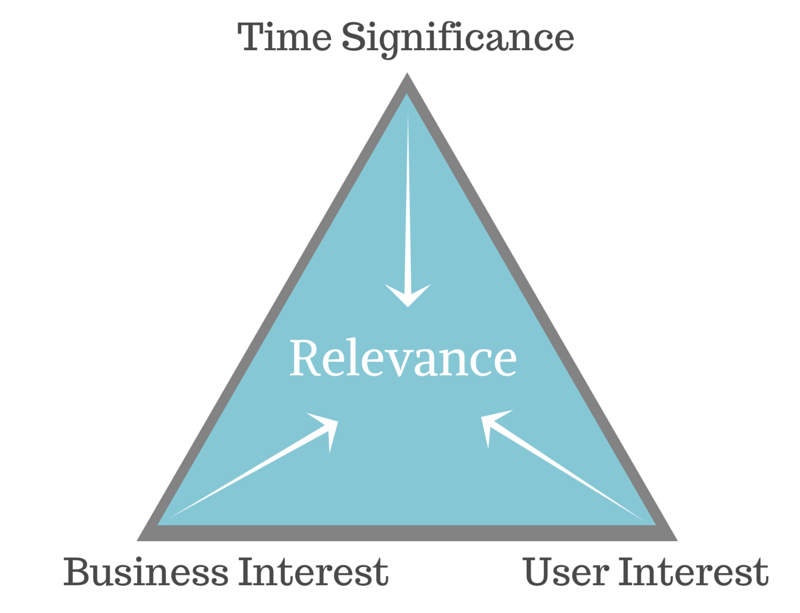 Angie Schottmulle discusses the Triangle of Relevance where three factors – business interest, user interest, and time significance – are aligned in order to create content that’s highly relevant. Thanks to journalism, we understand the importance in fact-checking and sourcing your information, and the terrible downfall of Steven Glass has been used as a warning for many against falsifying information and fudging facts. When you fact-check, and link to reliable sources, you also build a relationship with your audience based on trust – the strongest and most powerful tool that you can have at your disposal. So don’t be afraid to look critically at your sources. Are they from trusted and authoritative sites? Are they accurate? Are they recent? Visuals are a fantastic way to catch your audience’s attention and encourage engagement. Posts with visuals receive 94% more page visits and engagement than those without. But they’re not just for decoration either. 65% of people are said to be visual learners, so adding visual components to your content actually makes it easier for people to understand. To find visuals, check out these 35+ free image resource sites or you can create your very own original DIY visuals. Just like with keywords, general isn’t as effective as specific. Generalizations are everywhere on the net, but that content very rarely produces leads and customers. Instead of creating content that talks very generally about a subject, try to dig a bit deeper. If you provide your target audience with in-depth and well-research articles, you’re providing them with information that they don’t see and can’t find elsewhere. For examples of how to go deep, instead of wide, have a look at Brian Dean from Backlinko. His pieces are always well researched and provide extensive information, details and instructions which makes his content invaluable to his readers. Last, but definitely not least, is the tone of your content. The reasons people read content can be summed up in 2 words: Education and/or entertainment. Meaning: Your content has to be informational/educational and/or entertaining for it to be of any value to your readers. Actionable content falls firmly in the “educational” category. Actionable content is most clearly illustrated through how-to posts. These posts are instructional in nature, and usually provide a step-by-step rundown of information. 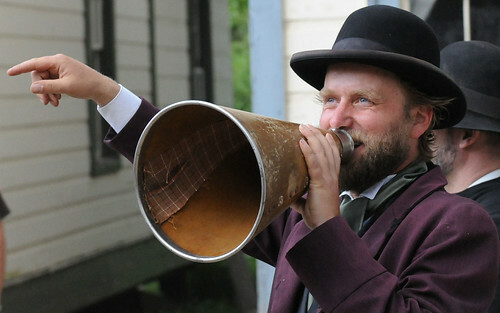 If you can also be entertaining while creating actionable content, all the better! Are there certain questions that pop up with regarding your industry frequently? Creating content that answers these questions is an excellent way to provide value to your customer’s lives. Again, if you can be entertaining as well – great! Do you have an unusual point of view on a certain topic? Can you weigh in on a relevant debate? Do you have experiences that might be contrary to popular opinion? Or a completely unique idea that hasn’t been considered before? So you know what makes great content, but now you have to generate some great content ideas and you might be feeling a little overwhelmed. Not to worry, we’ve some tips and tricks to get you kick started. Want to get a lot of ideas quickly? Why not try our 100 Blog Post Ideas in 30 Minutes Challenge. It’s effective, it’s quick, it’s… well, kind of terrifying. We’ve had a few readers come back to us after trying it out confessing that they were sweating and shaking all the way through! No one’s ever been dissatisfied with the results. If you already have a blog, look back at what posts perform the best. These are the posts that your audience loves from you, so ask yourself: Is there anything else you can add to the topic? Are you a definitive source of informative regarding this topic? Are there any updates you can add to it? Kevy creates content that caters around keywords that people already use to find them. By doing this, they’re making sure that they dominate search engines with regards these keywords, making them the ultimate experts. If you’re receiving repeat questions about a certain topic, then the chances are it can do with some content that can utilized a resource for your audience. Remember, if 1 person asks a question, there are probably 100 more out there with the same question. Have a look through your live chat, emails and phone calls etc. to look at frequently asked questions that are raised by your customers / leads. Creating great content is a challenging endeavor, and you won’t always produce it. However, if you manage to create consistent content, all the while keeping these 8 key factors in creating great content in mind, you will create something amazing. Stay tuned for next Tuesday where we’ll be talking about Website Usability & On-Page SEO! That's what we're here for. Get your very own A-Z guide and blogging templates and guides that will help you gain content marketing success!